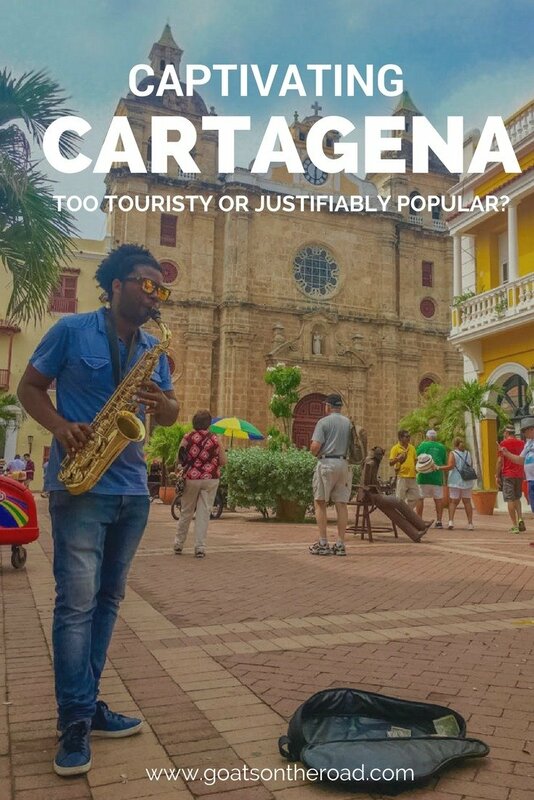 Goats on the Road Posts » Travel Blogs » Captivating Cartagena – Too Touristy or Justifiably Popular? 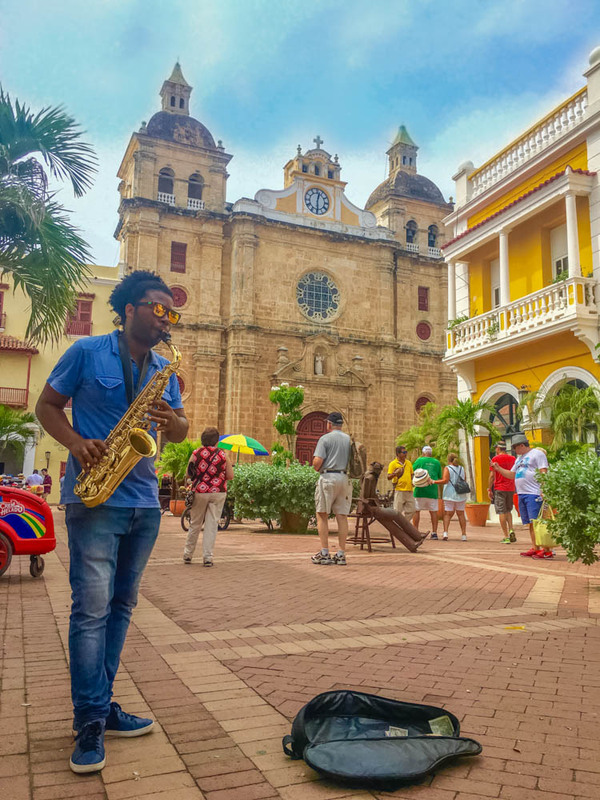 This is what we kept hearing for the 5 weeks of travelling around Colombia before finally making our way to the seaside colonial town of Cartagena. Because we typically love off-track destinations, this not-so-flattering description had our hopes low for Colombia’s prized tourist town. Our flight landed at Rafael Núñez airport at around 8:00 at night and we caught a taxi (13,500 COP prepaid) towards the Gistemaní neighbourhood near the old town. As the car barreled down the Santander highway, we looked out the window and wondered what all of the fuss was about. On one side of the road was a stretch of dark sand beaches that hardly conjured images of “Caribbean”, while on the other, an enormous city sprawled along the coastline with sardine-cramped sky scrapers jostling for their position to boast the best views over the sea. But, 5 minutes later we entered the walls of the old town and everything quickly changed. Brilliantly colored pastel buildings glowed under the dim light of antique style lanterns which clung to their 500-year-old walls. 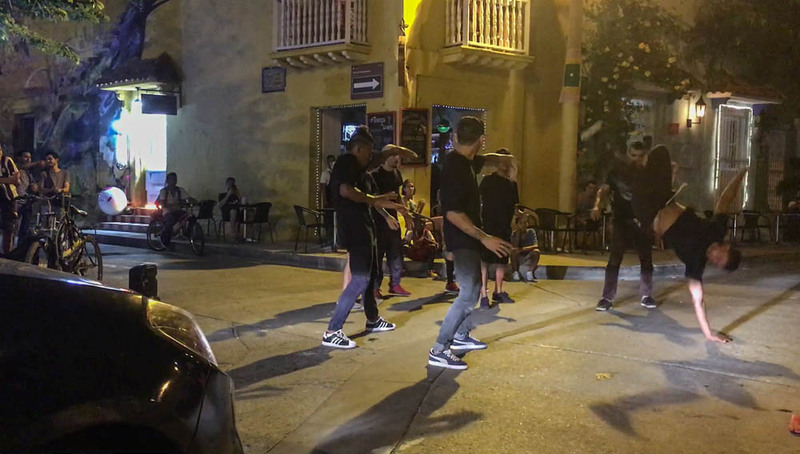 At night, the old town was alive, mostly with bar hoppers and backpackers walking in the streets, slowly parting as they noticed our taxi pulling up behind them. Even in the dim lamplight we could tell that the city had its own energy. The taxi dropped us off and we entered our hostel on Calle 30. Even after we entered the main doors and walked back to the reception, we could still hear the clatter, chatting and bass from music pounding on the main street. We looked around and immediately wondered if we had made a mistake in our accommodation option. The owner asked us our names and when we gave them to him, he looked at us with a genuinely confused expression. Maybe he thought we’re too old for this place? It turned out that the hostel had lost our reservation. After a 3 hour delayed flight from Bucaramanga (VivaColombia Airline is always late), we weren’t in the mood to search the busy streets for another hotel with our backpacks on. Luckily the owner was sympathetic to our situation and felt bad for double booking our room. 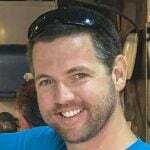 He walked me around the party zone and tried to help me find a room for the night, but the few that were still left vacant during the high season smelled musky and looked dated. When we first started travelling in 2008, these hotels would have suited us just fine, but we’ve since stopped staying at loud places that smell bad. Luckily, while I was out with the owner, Dariece found a place on Booking.com and when we returned, the owner of the hostel walked us to our new hotel. Patio del Gistemaní was just a couple of blocks away from the party area and the rooms there were far better than any I had seen (including the one at the hostel where we had originally booked), plus they were the same price and the place was silent. The super friendly family who owned the place checked us in with a smile and showed us to our room, which had a king-size bed and a nice modern bathroom. It turned out, the double-booking at the hostel was the best thing we could have asked for. The next morning we awoke to explore the old town of Cartagena. Sometimes as a traveller you arrive at a place and you click with it right away. You feel the vibe, you find good restaurants and you immediately fall in love. This was us in Cartagena. But it was a love that grew. The city reminded us a lot of Havana, Cuba – a city that is one of our favourites. The longer we stayed in Cartagena, the more we fell under its spell. Sure it was touristy, but Cartagena is one of those places that is so beautiful and so charming that you understand why it’s busy. Places this breathtaking are meant to be shared. Narrow cobble stone streets intersect one another and form a labyrinth of colorful colonial buildings that span almost two kilometers in every direction. 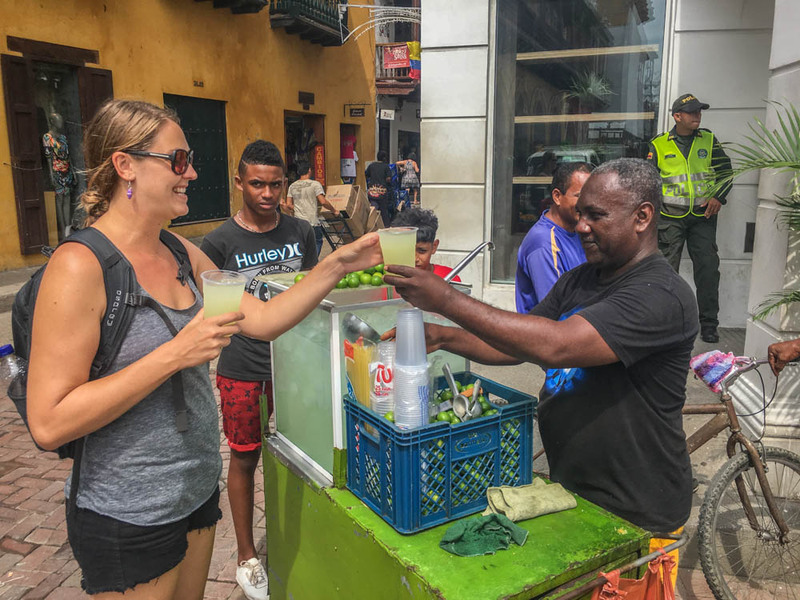 Street venders pushed carts over the uneven stone roads proudly shouting the quality of their fare: “Plátanos Frescos!” , “Limonada muy fría!” (Fresh bananas! Very cold lemonade!). Each building was painted in such a brilliant colors that the rows of homes and shops looked like an unsolved rubix cube. Bright pastel balconies with twisted wrought iron railings hung over the narrow sidewalks and together with enormous banyan trees and twisted flower vines, they provided much-needed shade from the scorching Caribbean sun above. The maze of fascinating streets would suddenly open into beautiful plazas that were often so busy with locals, tourists, street performers and children playing that it seemed like there was always some kind of event going on within them. 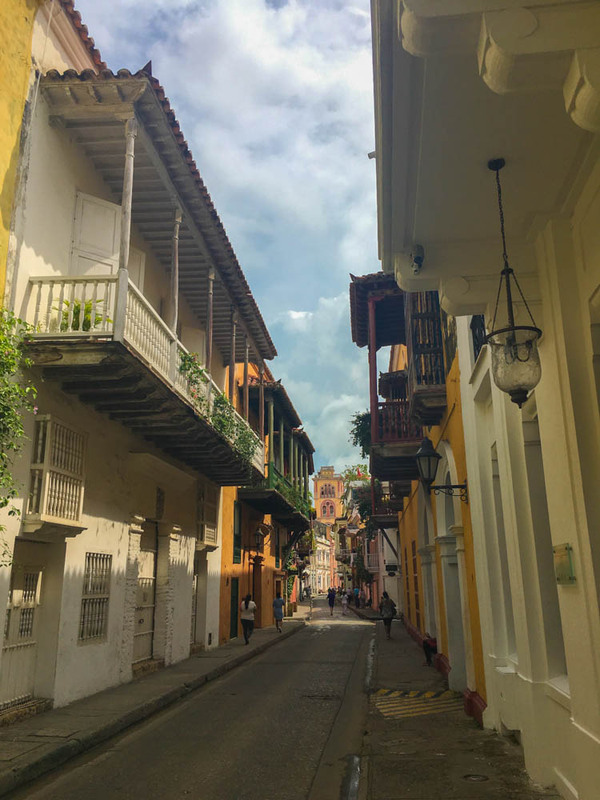 The old town was large enough that we continuously found new streets, quiet parks and romantic restaurants even after staying in Cartagena for 10 days. We walked around every day and never felt bored. On one day we hopped in a taxi (12,000 COP / $3.85) from Gistemaní and met our friends Andres, Carlos and Sebastian from Bogota on the nearby Morros Beach (Playa Morros). Those same dark sand beaches that didn’t look so appealing on our night drive into town turned out to be quite pretty in the daylight sun. 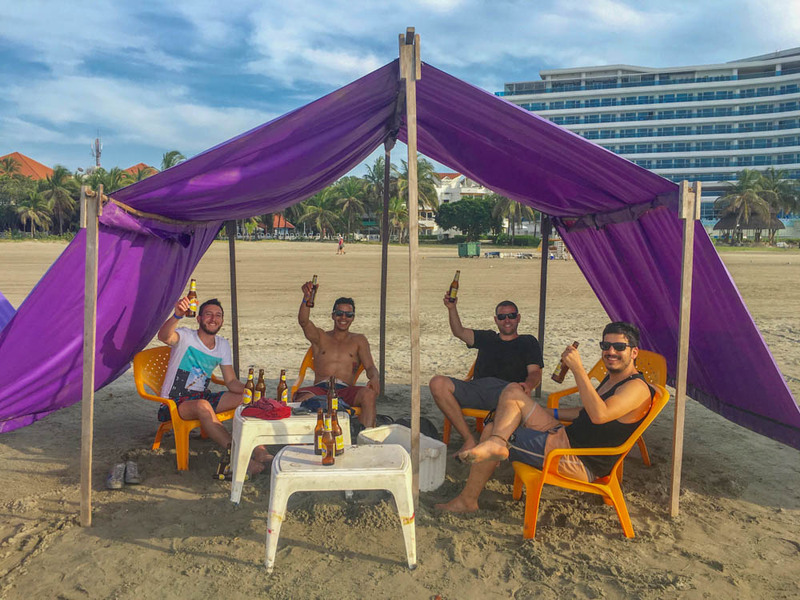 They still weren’t “Caribbean” in the sense that they didn’t have white sand and aquamarine water, but we rented a large polyester canopy for 15,000 pesos ($5) and sat with our friends while being served cold beers (6,000 pesos / $2 each). The water was cool enough to be refreshing and thanks to some clever manmade tide blocks, it was totally safe to swim. 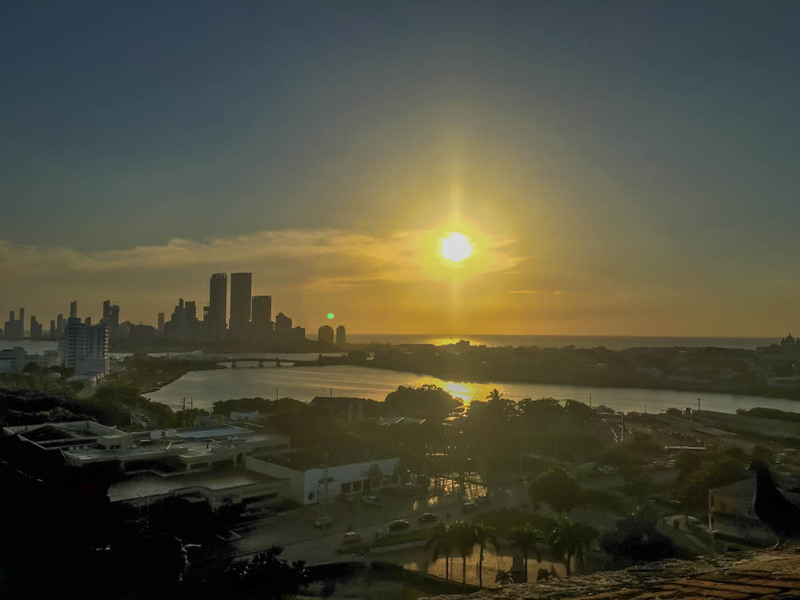 From the beach, the more modern part of Cartagena behind us still didn’t look appealing, but watching the sunset over the Caribbean just 5 minutes from one of the most beautiful old towns in the world was truly a memorable experience. 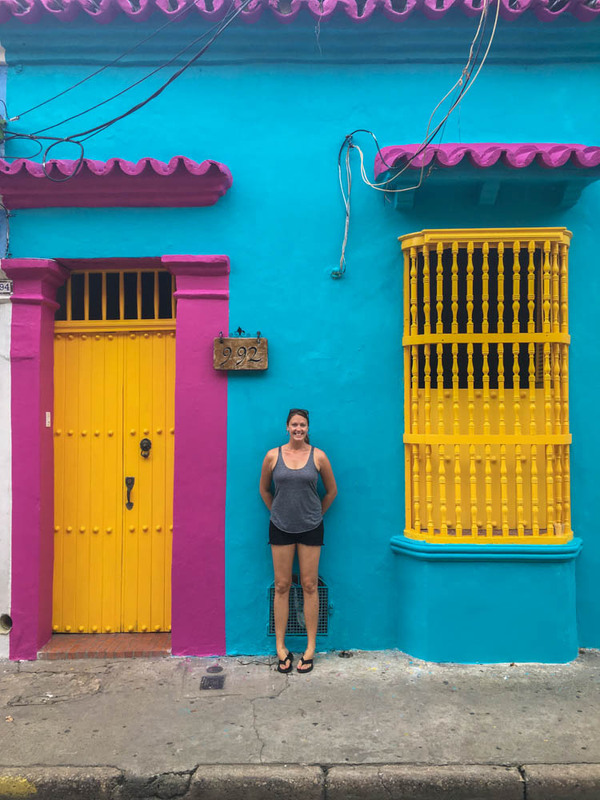 Cartagena is definitely a place we could live in, and it’s currently at the top of our list of the next digital nomad spots we plan to move to for a few months. On another day in the city, we visited the nearby Castillo de San Felipe de Barajas which is just a 10 minute walk from the old town. The fortress walls have beautiful views towards a symbolic trilogy of the poorer areas, the modern and the old town of Cartagena. The three versions of modern-day Colombia seen side-by-side from the fort display a stark contrast that represents Colombia today. On one side you have a struggling neighbourhood, still working hard to earn ends meet. Next you have towering sky scrapers and a modern city that represents developed Colombia and the obvious disparity of wealth there. 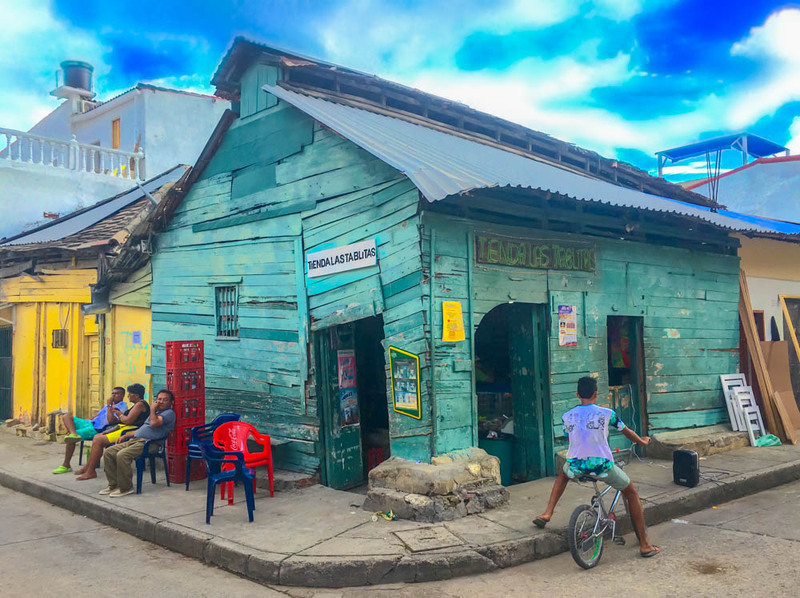 While the touristy old town represents the new Colombia, pulling itself out of a stigma-scared past and ready to show the world just how much it has to offer visitors. It’s easy to get lost in the charm of Cartagena and forget that you’re in a place with its own challenges. But hopefully the new light for the city and the country can be found in tourism and continued government peace talks with the FARC. Hopefully one day the 3 classes can merge to become closer and the country can become more secure. After the fort, we did what we did on most nights in Cartagena, we found a romantic looking restaurant with tiny tables spilling out onto a stone-floored plaza. We drank wine, ate delicious food and people watched. Often an impromptu live music jam session would break out in front of the restaurant. The local talent working hard at night to make a living from the booming tourism industry. We were always happy to give a few pesos – the performances were so entertaining! On one night we decided to go out and experience some of the nightlife in Cartagena. 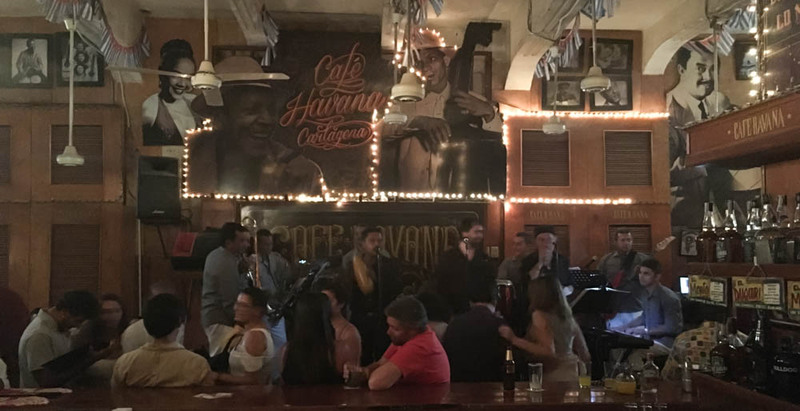 We went to Havana Bar which was packed with visiting Colombians and tourists from around Latin America and the rest of the world. A 9 man Cuban band blew feverishly into their instruments and the place was totally buzzing. People were dancing salsa all around us and the bartenders were churning out Mojitos and Cuba Libres faster than I can pour a glass of water. 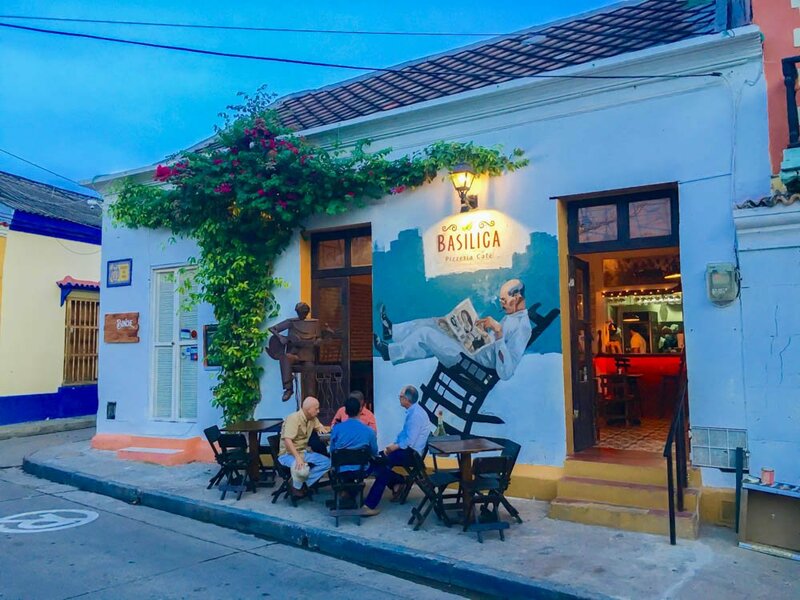 Havana is a touristy bar, but there were locals there too and we quickly realized that there’s a reason this place has so many people coming to enjoy the ambiance. It was probably the most entertaining bar we’ve ever been to and the live music was fantastic. Sometimes you just have to accept that amazing places become popular. That was our feeling in Cartagena. 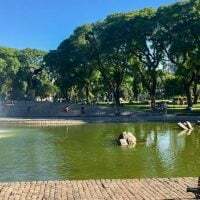 While at times the plazas and churches were congested with day-tripping tour groups, for the most part the city felt authentic and not too busy. The old town is large enough that you can always find a hidden corner. A couple of our favourite streets were Calle 27 and Calle 28 where there were only ever locals crowding the streets. 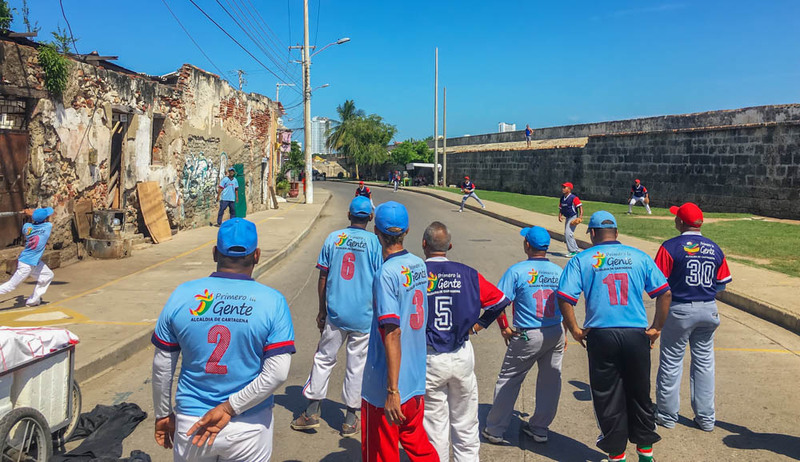 We saw sidewalk barbers cutting hair, boisterous men playing cards, and a full baseball game complete with uniforms even broke out in these streets one day. No matter what time of day we walked along these crumbling roads, there was always something going on. People use the sidewalk in front of their homes as a porch, laying out chairs and relaxing in the shade. Sometimes they would play dominos, drink a beer or just listen to their loud afro-latino music. To us, this was Cartagena. A wonderful mix of tourists and locals all living and travelling in one of the most breathtaking cities in the world. The city had it all. A beautiful old town, a lovely and swimmable nearby beach, and a busy city center with all the modern amenities and numerous events throughout the year including concerts, festivals, football games and carnival. We will one day return to Cartagena and next time we’ll likely rent an apartment in or near the old town and stay for a few months. It is one of the few places we’ve visited on our travels that we loved at first sight, and still it grew on us. Cartagena cast a spell on us as it does so many visitors, and we know that we’ll be back. As with any flights you book in Colombia, it may be worth booking with Avianca. It’ll probably cost you an extra few dollars (not much), but the flight will likely leave on time. Avianca has won awards for punctuality while VivaColombia and EasyFly have terrible track records. The taxi in from Rafael Núñez Airport only takes about 10 minutes to the old town and costs 13,500 pesos ($4.60). Taxis from the old town to Morros Beach cost 12,000 COP / $3.85. There are many hawkers and touts trying to sell day trips to Playa Blanca in the old town. Many people complain about these trips and say they’re a rip off. Consider visiting Isla Grande instead. The old town and Gistemaní area is easily walkable and you can’t really get lost. Don’t visit the fort in the middle of the day because it’s too hot. You can visit in the late afternoon and see the start of a sunset before the gates close. 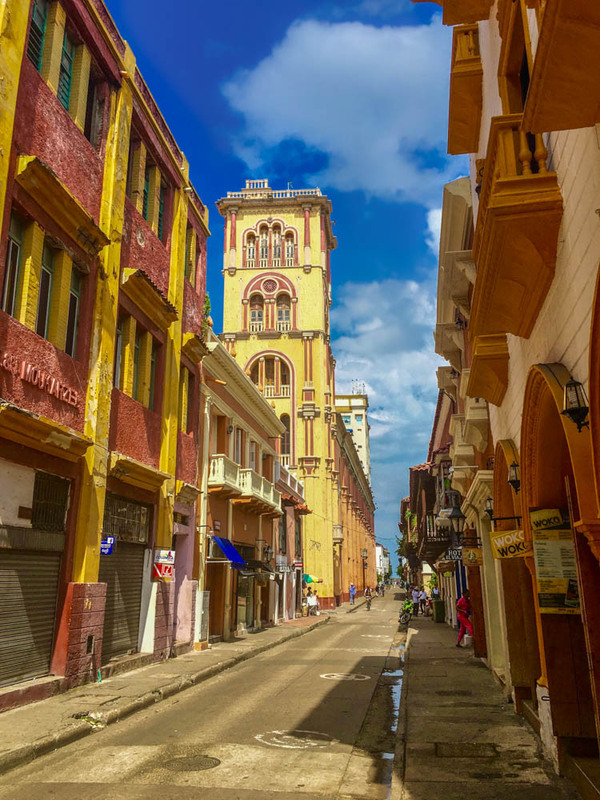 The old town and Gistemaní area are generally safe, but still be aware of your belongings and don’t walk alone down quiet streets late at night. Cartagena can be very busy during the high season, but outside of Christmas – New Year’s week, you should be able to find a nice place without booking too far in advance. Check out Booking.com for the best last-minute deals. Patio de Gestemaní Hotel costs $50 – $80 / night (depending on season) and is an excellent place to stay! I wish you would start your articles with a simple map so I can get a feeling just where you are. My world atlas is packed right now, and I admit that yes, I could look it up online, but it would add to your story. Nothing fancy, maybe just a map of the country and an arrow showing where you are. Hey, glad you came and enjoyed Cartagena. You got some great pictures too, I love the one with the baseball team! 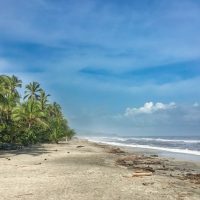 I’m going to Cartagena in a few weeks – found dirt cheap flights on Spirit. Glad you liked it! Can’t wait.